Also Faith tweeted that Lee is working on his autobiography. Lee has talked about this before so let's hope this comes to fruition. Happy National Pet Day to Bella & Buddy !! I just learned that the Legends in Atlanta show scheduled for May 11-12th has been cancelled. The promotor of the show Lee Ann Wyatt was killed in an automobile accident and they haven't been able to find anybody to take over the show. Our thoughts and prayers go out to her family and friends. Remember Lee will be at the German Comic Con in Dortmund Germany April 13-14th. A reminder that our friends at the Cyborg Lee Majors site are putting together a fans and friends book to present to Lee on his 80th Birthday in April. 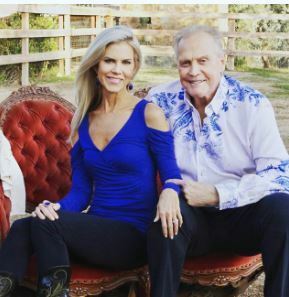 If you would like to contribute a message, go to Lee Majors and wish Lee a Happy Birthday. Faith posted a picture of Lee relaxing on vacation. I hope your new year has started out wonderful. Lee has 2 conventions set up so far on 2019. We're wishing everyone a glorious holiday season and may your New Year be filled with beautiful moments and treasured memories.